EU member states have reacted in different ways to the security threat highlighted by the Paris terrorist attacks, pointing to how difficult it would be to put in place a common European response to the challenge. The EURACTIV network reports. EU ministers are devising ways to respond to the Paris killings, which range from the confiscation of travel documents of people considered dangerous, to speeding up agreements for the exchange of traffic data of passengers, and strengthening, or reforming the borderless Schengen Area. The European Commission is reluctant to take a leading role, saying that only member countries are equipped with intelligence services and can assess the security threat. What follows is an overview of measures taken in across the bloc. In France, military forces and police are “everywhere” since 7 January, when the terrorist attack on Charlie Hebdo took place. French Prime Minister Manuel Valls said that 122,000 law enforcement personnel were tasked with the protection of the French population. The Ministry of Defense decided to deploy 10,500 soldiers to sensitive areas, with nearly half of them assigned to the protection of the country’s 717 Jewish schools. In front of each of these schools, military vehicles are stationed, along with several armed soldiers. Other places at risk include religious areas like synagogues and mosques. A special prefect in charge of the protection of religious places has been appointed. Newspaper buildings are also on the list of Interior Ministry, and all of them are looked after by at least one police officer. The Canard Enchainé, another satirical newspaper, is under even stronger protection after receiving serious threats on 8 January. “It’s your turn,” warned a message sent to the Canard Enchaîné, threatening to kill the journalist “with an ax”. A formal investigation has been opened by a Paris prosecutor on this threat. On 14 January, the Council of Ministers adopted a decree forbidding certain people to leave French territory, and prohibiting foreign fighters from entering France. Rightists haved tried to advocate for some sort of French “Patriot Act”, but the government does not agree, and says it would not rush to adopt a new law. The French authorities remain opposed to any emergency or exceptional measures that would damage civil rights. However, Valls called on the European Parliament to vote in favor of an agreement on Passenger Name Records, or PNR, a single registry of air traffic data. The proposal, initially tabled in 2011, is currently blocked in the European Parliament, where MEPs are concerned about the protection of individual freedoms and privacy. The country hosting the EU institutions discovered that it was also the target of terrorist attacks, not necessarily related to the Paris attacks. Belgian police killed two men who opened fire on them during one of about a dozen raids on 15 January, against an Islamist group that federal prosecutors said was about to launch “terrorist attacks on a grand scale”. The killings took place after the police conducted raids on the homes of “foreign fighters”, that is, Belgian nationals who have returned from the Syrian conflict, where they had been fighting a holy war, or jihad. Earlier in the day, in an apparently unrelated development, police detained a man in southern Belgium whom they suspected of supplying weaponry to Amedy Coulibaly, killer of four people at a Paris Jewish grocery, after the Charlie Hebdo attack. With half a million Muslims, mostly of French-speaking North African descent, among its 11 million citizens, Belgium has seen similar discontent to that in France among young, unemployed children of immigrants in blighted, post-industrial towns like Verviers, once a major centre for wool, and other textile mills. One of the measures adopted in Belgium concerns wiretapping. The legal framework in which the judiciary can authorise wiretapping is being made more flexible, so that wiretaps can be performed more quickly. Another planned package of measures reportedly includes the freezing of assets of foreign fighters and stripping terrorist fighters of their Belgian nationality. For a country of its size, more Belgians have taken part in the fighting in Syria than any other European state. The Belgian government believes about 100 of its nationals have come back with combat experience. A further 40 may have been killed, and about 170 are still in Syria and Iraq. As a reaction to the threat of radical Islamists, the German government intends to withdraw the personal identification cards of potentially violent extremists for a much longer period than was initially planned. According to Internal Affairs Minister Thomas de Maizière’s draft law, these ID cards could soon be confiscated for up to three years. Previously, the government had indicated that confiscation periods would not exceed 18 months. In this way, authorities hope to prevent jihadists from leaving the country to go to conflict regions in Syria and Iraq. Those affected by the measure would receive a replacement ID which does not permit the holder to leave Germany. In addition to personal ID confiscation, Germany’s Justice Minister Heiko Maas is planning to make it a punishable offence to prepare for travel to a terrorist camp. Here, the German government is relying on a UN Resolution from September of last year on foreign fighters. Firstly, persons who seek to leave Germany to participate in “acts of violent subversion” abroad or to train for participation in such acts would be liable to prosecution in the future. Second, a new criminal offence for terrorism financing is also underway in Germany. 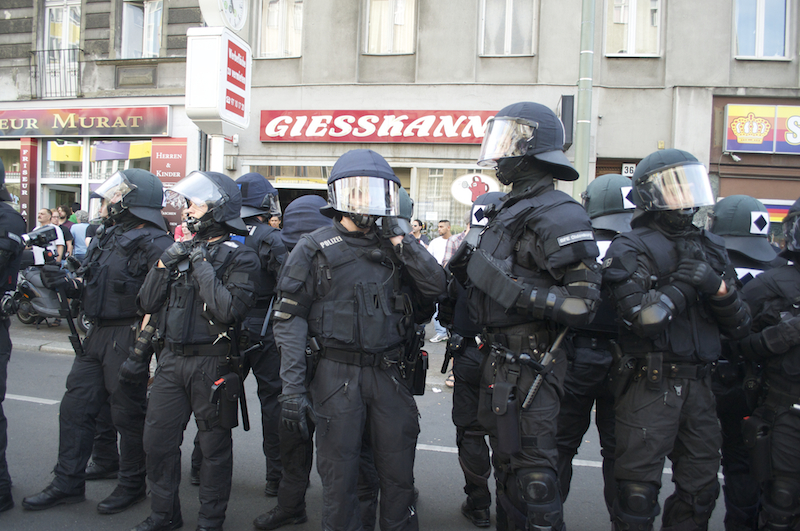 Police forces are also calling for additional mobile communication frequencies for German security authorities and the Bundeswehr, Germany’s military. Hours after meeting with security chiefs on 12 January to discuss Britain’s response to the atrocities in France, Prime Minister David Cameron said that if his Conservative Party is victorious in the general election in May, he will push to introduce “comprehensive” legislation to give intelligence agencies more powers to track Internet and cellphone data. He indicated that any new legislation proposed by his party would oppose platforms that permit encrypted communication that couldn’t be accessed even with a warrant. Such measures could possibly include Apple’s iMessage and WhatsApp. Immediately after the Paris terrorist attack at the headquarters of Charlie Hebdo, Minister of Internal Affairs Angelino Alfano met the Committee for Strategic Anti-Terrorism Analysis to study and develop possible actions to prevent future terrorist attacks in Italy. After the meeting, Alfano announced that the monitoring activities and the security measures of vulnerable targets (such as institutional buildings and places of worship, but also newspapers headquarters and TV stations) would be reinforced, and that specific attention will be paid to Vatican City, and the Pope. With respect to “foreign fighters”, the Italian government has prepared a regulation for the application of “measures of personal prevention” that the police will use against people under suspicion of organised crime. The regulation will also help the Italian police reinforce controls on the web (often used as a vehicle to recruit and train terrorists) through specific actions, such as the creation of a blacklist of suspected pro-jihad websites. Spanish Secretary of State for Security Francisco Martinez met on 13 January in Strasbourg with Commissioner for Migration, Home Affairs and Citizenship Dimitris Avramopoulos, and proposed that European institutions jointly respond to jihadist terrorism. Martinez informed Avramopoulos about amending the draft Law on Protection of Public Safety, which aims to incorporate into the Aliens Act a provision adapted to the geographical, border security and uniqueness of the Spanish enlaves of Ceuta and Melilla, because of the assaults on their fences. The goal is to “win legal certainty”. Spanish Interior Minister Jorge Fernández Díaz raised the possibility of changing Schengen’s rules to allow some border checks “aimed at those people about whom there is a clear risk or a real suspicion that they could be terrorists”. Following the attacks in France last week, Danish Prime Minister Helle Thorning-Schmidt is looking into how the Danish secret service can get extra resources to fight terrorism, and also to push forward a referendum on its opt-out from EU justice and home affairs cooperation. In order to strengthen EU-wide police cooperation and to collect passenger data, Denmark needs to get rid of its opt-out on EU Justice, one out of four opt-outs which the country currently holds. The other opt-outs include the Monetary Union (EMU), Defence and ‘Citizenship of the European Union’. In October, Thorning-Schmidt first announced that a referendum on the Justice opt-out imminent was imminent. In December, a majority of the parties in the parliament made an agreement which stated that irrespective of the results of the general elections, which have to take place before 15 September this year, a referendum will be held before the second quarter of 2016. In the wake of the Paris attacks, both Prime Minister Robert Fico and Interior Minister Robert Kali?ák expressed their satisfaction with the work of Slovak information service (SIS). Slovakia is against restoring controls at the internal Schengen borders. “Our secret services are high profile. I don´t think there would be a failure,” Fico said, suggesting that his country didn’t feel threatened. Kali?ák too stressed that there was no immediate security threat and no sign of increased risk of a terrorist attacks. To prevent them, the Anti-Terrorist Branch, the Department of the fight against terrorism and the National Security Analysis Centre are deployed and fully operational, he added. The Interior Minister commended French security forces for having done their best. The Minister of Foreign and European Affairs Miroslav Laj?ák said Slovakia was not perceived as a Western symbol. “Therefore, we should emphasize the prevention and the monitoring. Placing any restrictions beforehand, not knowing where they lead, would be counterproductive,” Laj?ák said. Warsaw hasn’t been active, except for taking part in the interior ministers’ summit in Paris on Sunday. Interior Affairs Minister Teresa Piotrowska said some vague words about “being vigilant”. There is no sense in Poland that something needs to be changed. The Paris attacks revived talks on the issue of the so called “big brother” law, designed to regulate prepaid SIM cards. The law is intended to introduce retention of client data by telephone and internet providers, and will also require citizens to provide their personal identification number when purchasing a prepaid SIM card. These two legislations have been put down by the Romanian Constitutional Court last year, but the recent terrorist attacks inspired officials to resume discussions leading to the adoption of such legislative acts. Another measure that follows a larger geopolitical context concerns the adoption of a cross-party agreement on increasing the country`s defence budget. The proposal came in the first days of 2015 from President, Klaus Iohannis, who invited all political parties to assume a 2% GDP allocation for the defence budget for the following 10 years. After separate consultations with all major political parties, an agreement was signed to uphold this objective. In the meantime, Socialist MEP Ion Mircea Pa?cu expressed concerns that Romania’s bid to join Schengen, the EU’s borderless space, could be delayed because of the terrorist attacks, or even worse, that Schengen could be suspended. “From this point of view, we cannot give up the freedom of movement in exchange of the right of opinion. Democracy comprises both,” he told EURACTIV Romania. In Bulgaria, Minister of Defense Nikolai Nenchev was quoted as saying that the country’s anti-terrorism legislation would be reviewed. But more importantly, Bulgaria, already overwhelmed by asylum seekers who enter the country through Turkey, is adding an additional 130 kilometers of fence to their border. On several occasions, the Bulgarian government expressed concern that terrorists could penetrate the country under the cover of asylum-seekers. On 13 January, the Bulgarian authorities said they had arrested a French citizen suspected of having links to one of the perpetrators of the terrorist attacks on Charlie Hebdo. Fritz-Joly Joachin, 29, was first detained under an international arrest warrant while trying to enter Turkey on 1 January, a week before the Paris attacks. The warrant, issued by the French authorities, said Joachin had abducted his 3-year-old son. On Monday, Bulgaria received another warrant from Paris alleging that Joachin was a member of a criminal group preparing terrorist acts. Reportedly Joachin had been in contact with Cherif Kouachi, one of the brothers who carried out the Hebdo attack. He is now awaiting extradition to France. Greece is in election mood, as early general elections to be held on 25 January will determine the future of the country and its relations with EU partners and creditors. Security concerns are therefore not a major issue. Vasilis Kikilias, minister for Public Order and Citizen Protection, told EURACTIV Greec that Athens closely follows the developments in France. “We have contributed and we will help if needed, but I think that for now there is not any terrorism issue in our country,” Kikilias said. He also emphasised that Greece is a safe country and proved it with its success in combating internal terrorism. “There is cooperation with all the allies within the EU and NATO because nowadays, crime is not local but cross-border, sometimes cyber, and we must be vigilant,” he concluded. “Cyprus will take all the necessary measures to prevent such a terrorist attack,” the country’s President Nicos Anastasiades said on 14 January, without elaborating more. He also declined to comment on the statement of the head of Cypriot intelligence services, Andreas Pentaras, who said that jihadists use the territory occupied by Turkey as a gateway to Europe. EU candidate Turkey, which shares a 900 kilometer land border with Syria, is believed to be a major transit country for European foreign fighters. On 12 January, Turkish Foreign Minister Mevlüt Çavu?o?lu said that Hayat Boumedienne, known as France’s ‘most wanted person’, was recently spotted in Turkey. Boumedienne is reported to be the partner of Amedy Coulibaly, the perpetrator of the attack on the Jewis supermarket in Paris, who was killed by the police. Çavu?o?lu said that Boumedienne entered Turkey on 2 January from Madrid, and that mobile phone records make it clear that she crossed into Syria on 8 January. “Even before France asked us, we shared this intelligence [with France] as soon as we had it. We told them, “Look, the person you are looking for came here, stayed here and illegally crossed into Syria,” said Çavu?o?lu. Turkey says that it doesn’t tolerate the transit of foreign fighters via its soil, and often complains that European countries are reluctant to share intelligence with Turkish authorities, despite the threats. Struggling to cope with the irregular flow of people at its southern border, Turkey says that it is not possible for them to screen each and every person entering from Europe for threats, and that only if European authorities share intelligence in a timely way, it could hand “dangerous” people over. On 9 January, the government of Serbia, an EU candidate country, established a permanent group for the fight against terrorism. Media reported that the security services strengthened the monitoring of extremists. The biggest threats are from football fan groups and of jihadists that return from Syria. Fighting wars in other countries is a crime, according to Serbian legislation. Dnevnik, the EURACTIV partner in Bulgaria: ????? ?? ??????????? ???? ???? ?????????????? ?????? ? ????? Dnevnik, the EURACTIV partner in Bulgaria: ???????? ??? ??? ?? ??????? ??? ???????? ?? ?????????. ?? ?? ???????? ?????????????????? ?????? Dnevnik, the EURACTIV partner in Bulgaria: ??????????? ??? ?????? ? ?????? ?????????? ?? ????????? ????????? Oh dear we appear to have a believer in the Protocols of Zion here.